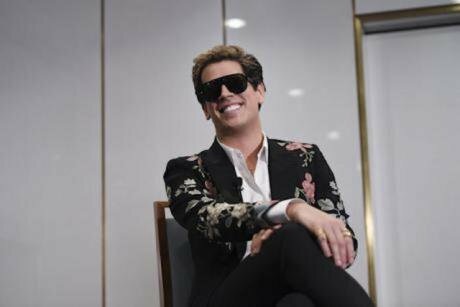 Will "they shall not pass" stop Milo Yiannopoulos in his tracks? The British alt-right commentator speaks at Parliament House in Canberra, Tuesday, December 5, 2017. Lukas Coch/ Press Association. All rights reserved.In a seemingly unusual move, Acadia University in Wolfville, Nova Scotia, recently announced that it was investigating Professor of Psychology, Rick Mehta, because of complaints over controversial comments he made in class and on social media on a range of issues from the value of multiculturalism, to the nature of residential schools, to the existence of gender inequality in the workplace. In a letter dated February 13, Acadia’s President, Heather Hemming, suggested that these views may have undermined the university’s “legal responsibility to provide an environment free from discrimination, sexual harassment and personal harassment.” According to the CBC, the university has retained emeritus law professor at Dalhousie University, Wayne MacKay, to conduct an investigation into the matter. In contrast, this past week we’ve seen some welcome moves from other Canadian universities, Queens and McMaster in particular, to protect respectful and informed debate. As Daniel Woolf, Principal and Vice-Chancellor of Queens University makes clear in a recent blog post, without “disciplined and respectful dialogue, debate and argument” the very raison d’être of the university is threatened. Presumably, this includes asking difficult questions about multiculturalism, residential schools, gender inequality in the workplace and so on. The moves of Queens and McMaster are in response to, among other things, recent events at Wilfrid Laurier University, located in Waterloo, Ontario, about ninety-minute drive from Toronto, and are indicative of a growing tendency of some on the left to seek to stifle debate and discussion out of a well-intentioned though, in my view, ultimately misguided attempt to prevent or mitigate harm to vulnerable communities. While I sympathize with this impulse, my view is that the stifling of speech and expression will only, ultimately, be used against those very communities. The very arguments to minimize “offensive” speech are also currently being deployed, for example, to stifle discussion of the role of BDS in addressing Israel’s treatment of Palestinians. Wilfrid Laurier was the site of controversy generated last fall by a graduate student’s decision to show the class she was tutoring a five-minute clip of Professor Jordan Peterson speaking in the context of a discussion on a local television newsmagazine show about the use of gender pronouns. The tutorial assistant in question, Lindsay Shepherd, was subsequently brought into a meeting with the course director and two senior administrators and up-braided for her action, which was likened to the dissemination of Nazi propaganda. The course director also said that one or more students had complained. We know the intimate details of this supposedly private conversation because Shepherd secretly taped and subsequently disclosed it. An investigation revealed that there had, in fact, been no student complaints whatsoever. The reason why Peterson’s views had been so controversial is because, amongst other things, he opposed Bill C-16 recently passed by Parliament last November, which adds gender identity and gender expression to the list of prohibited grounds for discrimination in the Canada Human Rights Act. He has also advocated the dismantling of entire departments such as anthropology, sociology, English as well as law schools because he saw them as purveyors of what he called “neo-Marxist, post-modern ideology.” And such advocacy clearly clashes with his defence of free speech and academic freedom. While he was already gaining in popularity due to his many YouTube lectures, the Laurier controversy dramatically added value to his brand and no doubt boosted sales of his recent self-help book 12 Rules for Life: An Antidote to Chaos. It has also fuelled the rise of the so-called "alt-right" in Canada. That progressives now aggressively advocate limiting free speech shows the extent to which it has traded places with the Right – the traditional defender of censorship. This is an important claim recently made in the openDemocracy article by Simona Levi and Xnet2 commenting on the Spanish left’s apparent inability to understand and cope with new, digital forms of expression. Of course, once upon a time, it was the Left that led the battle for freedom of speech and expression, a tradition that can be traced all the way back to the origins of the Left itself in what Jonathan Israel calls the “radical Enlightenment” and the writings of Condorcet, d’Holbach, Diderot and heterodox Jew, Baruch Spinoza. It was the radical Enlightenment that played an instrumental role in challenging an ancien regime grounded in tradition, faith and authority which culminated in the revolutionary tradition that inspired among others the Haitian Revolution of 1791-1804. Invoking this tradition of radical Enlightenment, the Free Speech Movement, led by Mario Savio, was born in the 1964-65 term on the campus of UC Berkeley. The long-standing FSM agitated for the lifting of restrictions on free speech and for academic freedom for students. Three years later, at Templeton Secondary, in Vancouver, Canada, a student was suspended for writing a parody of the school’s literary magazine. Five Simon Fraser University teaching assistants – subsequently known as the “Templeton Five” – were briefly suspended by the university for supporting that Templeton student. Indeed, as late as the anti-G20 protests in Toronto in 2010, a “free speech” zone was established among the activists. This a period in which the Left was confident in the force of its own ideas. Things appear, strangely, rather different today. It was precisely these battles over the right to free speech and academic freedom that, at least in part gave Berkeley and SFU the radical reputations that they once possessed. At the Institute for the Humanities at SFU, which I have directed for the past seven years, we try, in our own modest way, to keep faith with this radical period of SFU’s history. But this pits us against contemporary left opponents of free speech. Free speech and academic freedom are vitally important to us because we feel it to be our responsibility to foster discussions on controversial subjects such as the on-going expropriation of Indigenous peoples in the Americas, and, relatedly, the role of extractivism in the Canadian economy, as well as the baleful fate of dissent and the treatment of Palestinians at the hands of the Israeli state, and the contemporary rise of the far-right. For this, we have come under fire from mining companies and Zionist organizations who have objected to some of these activities and demanded that we “cease and desist” or for equal time to air their perspectives respectively. Fortunately, thus far, SFU, whose motto is “engaging the world,” has stood by us. The former Director of McGill’s Institute for Canadian Studies, Andrew Potter, was not so lucky, as it seems he may have been forced out after having written what was, perhaps, an ill-advised article for Maclean’s Magazine criticizing la belle province. Particularly concerning was the claim by McGill President, Suzanne Fortier that “it’s not the university’s role to provoke but to promote good discussion.” We respectfully beg to differ: “good discussions” around anti-slavery in the nineteenth century, or gay rights in the middle of the twentieth century, were not just promoted but had to be actively and forcefully provoked. And such provocations led to momentous and irreversible social transformation. But it isn’t just from conservative groups that we face increasing constraints on what we do. It is for that reason that I look upon radicals, particularly within the university, with a certain amount of bemusement. In contrast to their predecessors in the 1960’s, rather than arguing for a broadening of the ambit of free speech and academic freedom, today they wish to foreshorten it. For example, Milo Yiannopoulos’ planned talk at Berkeley on September 24, 2017, was shut-down amidst the strong-arm tactics of anti-fa protestors and the ensuing mayhem of counter-protests and tear gas. Why – radicals today might ask – shouldn’t his talk have been shut down? After all, his misogynist and racist views are clearly reprehensible and therefore he ought to be actively denied a platform (or “No Platformed”) to publicly express and generate support for them. With regard to Yiannopoulos, of course they have a point, insofar as he seems neither interested in nor capable of respectful dialogue. There are those in Canada who argue that Professor Jordan Peterson should, similarly, be prevented from speaking insofar as what he has to say is often offensive and even deeply hurtful to trans-gendered people, in particular. But the answer isn’t so straightforward. It may be true that the views of these men – heroes of the “alt-right” – are offensive and therefore “harm” others. When assessing the limits of individual liberties, as the influential liberal political philosopher, J.S. Mill argued, it is necessary to take into consideration the harm to others that may result from the exercise of those liberties. Mustn’t we also, however, consider the harm done to democracy as a whole? The “No-platforming” of speakers with whom we fundamentally disagree can suggest that force ought to prevail over speech that is itself regarded as “violent.” This suggestion is deeply corrosive to a society whose democratic institutions have, themselves, already been shaken to the core. Moreover, if such reprehensible views are not aired publicly they are driven underground where they often metastasize. By being brought into the light of day they can be refuted and effectively countered. Think, for example, of the racist and xenophobic views that remained repressed in the former East Germany in which the Nazi legacy was simply denied rather than being confronted and worked through in the context of an official party line of solidarity with the Third World. Once the regime fell, we saw some of the most brutal attacks on asylum seekers in eastern German cities like Rostock in the early 1990s. As the Peterson case exemplifies, by silencing the speech of those with whom we disagree, we create martyrs who are consequently able to gain many more adherents (and, of course, customers) than may otherwise have been the case. Finally, and most importantly, limitations on free speech and academic freedom ultimately will target the left disproportionately. If it were simply a matter, though, of shutting down racists, transphobes and misogynists, that would be one thing. However, over the past couple of years, the practice of the left has increasingly become one of silencing its own. One of the most egregious is the case of Rebecca Tuvel, a tenure-track professor at Rhodes College in Memphis, Tennessee. Tuvel published an article in the feminist philosophy journal Hypatia via the normal peer-review process. It contended that the logic that underlies trans-gender identities also applies to trans-racial identities. The article was not, to say the least, well-received. Upon its publication, an open-letter was drafted demanding that the piece be retracted, and listing its many failings including the fact that it “dead-named” Caitlin Jenner (“dead-naming” is the act of referring to a trans-person by the name they assumed prior to their transition) despite the fact that Jenner went through a very public and lucrative transition and continued to refer to her previous name. Tuvel’s article was therefore charged with having perpetrated what the letter called “epistemic violence” against trans people. The letter was signed by over eight hundred academics – many of them senior, tenured faculty – including high-profile figures Wendy Brown and Judith Butler. This response can only be thought of as a kind of “academic mobbing” that utterly trampled on the academic freedom of a young female professor of philosophy – a discipline, incidentally, not exactly overrun by women. Tuvel was particularly vulnerable because the controversy could very well damage her case for tenure and therefore her future. My interest here is not to judge the merits of Tuvel’s article, but simply to suggest that if it were found problematic for whatever reason, despite having undergone peer-review, it should be subject to what Principal Woolf calls “disciplined and respectful dialogue, debate and argument” rather than meeting with a ham-fisted demand for its retraction. This crisis of free speech and academic freedom runs very deep and suggests that something profoundly disturbing is afoot in North American universities. It can scarcely be denied that the far-right has effectively taken hold of free speech as its cause célèbre, however, this cannot but be seen as profoundly cynical insofar as right-wing governments globally have seized every available opportunity to crack down on dissent. But one ought to expect better from the left as it presumably has a profound interest in "speaking truth to power” via non-conforming, dissenting perspectives. Perhaps, rather than closing down discussion of offensive opinions, such opinions ought to be met head on as is exemplified by the Indigenous actor, Garret Smith, who set up a tent in front of a Calgary courthouse to protest what he considers to be the unjust treatment of Indigenous people in Canada. He wants to create a “safe place to come and engage in conversation about reconciliation…Come and ask hard, ignorant, racist questions here,” Smith challenges, “this is a space place to actually understand each other.” Perhaps the university has much to learn from the likes of Garret Smith.